Onigiri is a rice ball made from white “sticky” rice. Typically they are in a triangular or cylindrical shape. 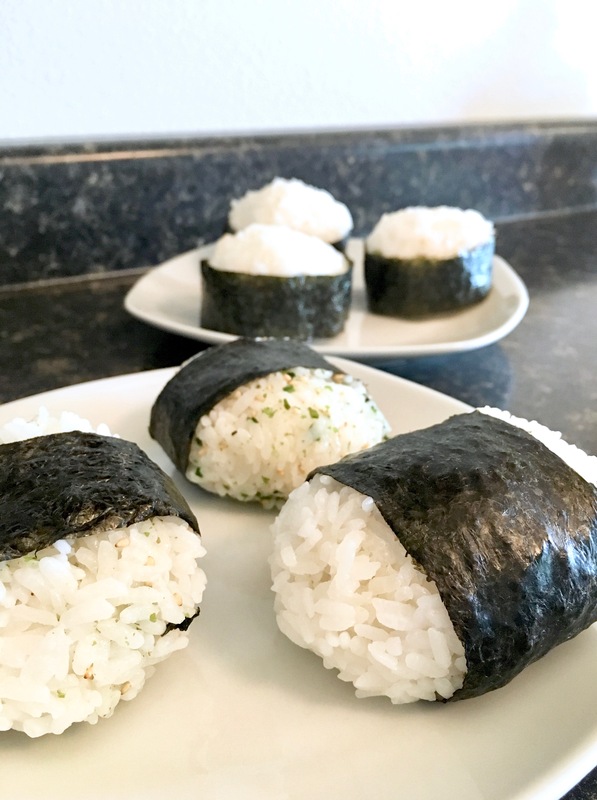 You can find onigiri wrapped in nori seaweed (the same kind of seaweed used for sushi rolls), filled with umeboshi (pickled plum), or filled with things liks salmon, pickled fruit or vegetables, dried foods, tempura, pork or other kinds of fish. 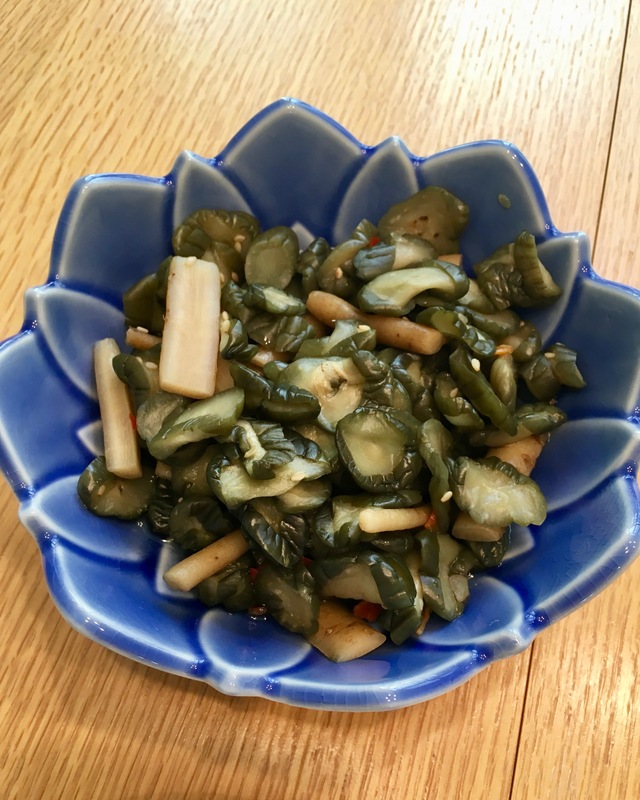 You can also spread miso paste like Marukome Ryotei No Aji on top and fry in a skillet or just mix in rice seasoning like JFC Nori Komi Furikake. You can also make onigiri sandwiches and yaki onigiri which are grilled rice balls. I will be attempting this at a later date. While in Japan, for breakfast, along with miso soup, we ate rice balls. During my miso soup lesson with my grandmother, we made rice balls. They are very easy to make and delicious. I used Nishiki Medium Grain white “sticky” rice and any Nori Roasted Seaweed Sheets will do. I prepared my rice using a rice cooker by first rinsing the rice. To rinse rice, place 1-1/2 cups in the removable cooking pot and add just enough water to cover grains. Carefully slosh pot in circular motion and slowly tilt pot to drain water, repeat once more. Then add 2 cups of water and place cooking pot back in rice cooker base to cook. You can eat onigiri plain or dip in soy sauce or a soy sauce and wasabi mixture. 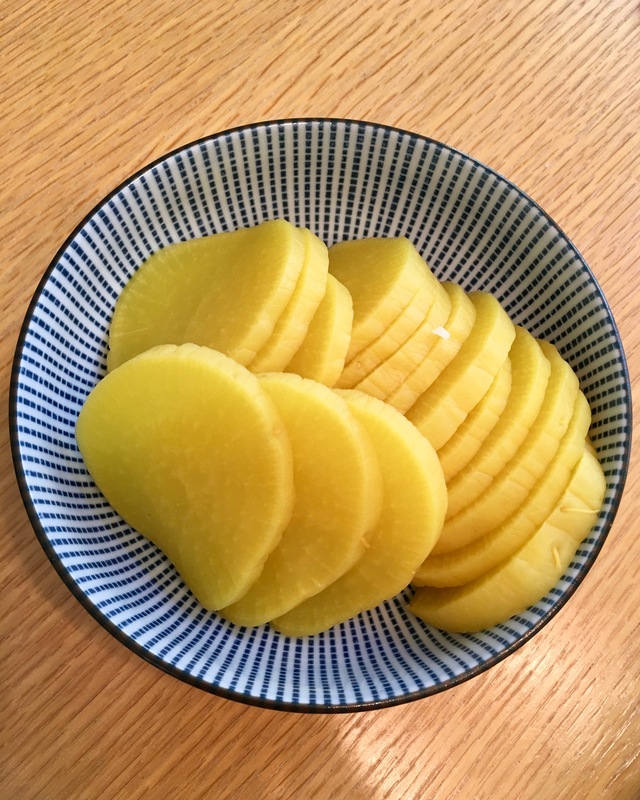 We ate our onigiri with pickled radish and some kind of pickled cucumber and burdock root (gobō) that I brought back from Japan. I was not a fan of it but my grandmother loves it. Prepare rice using the instructions on the package on the stovetop or in a rice cooker. Allow rice to sit for a few moments after cooking is complete. Place rice on plate or container in a thin layer to cool. Using kitchen scissors cut nori into thin strips. If you want to mix in rice seasoning, sprinkle on top of a small section of rice. Wet hands and mold rice into triangular or cylindrical shape. If you want to add inside filling, wet hands and place a bit of rice (decide the amount based on the size of your filling) on another plate. Place filling in the center and then add another bit of rice on top. Wet hands again and begin molding the ball into shape. Set aside. Repeat. The amount of rice balls will depend on what size you prefer to make them. Use nori as you like. With the rough side down, wrap around the center or around the edges. Add a drop of water to nori ends to make them stick together.